Before I hit the hay for my 'disco' nap I wanted to acknowledge a few things/people . 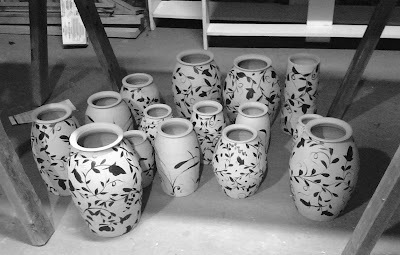 How amazing it is that all the pots got in, like a funny 3D jigsaw puzzle. 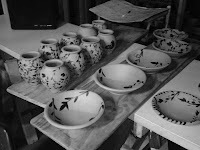 How lucky I was to meet Mica Cain, who is the new resident potter at the Energy xChange, just down the road. 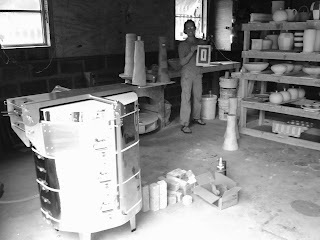 He is 28 and this is the 28th firing of the kiln and it's sixth anniversary! 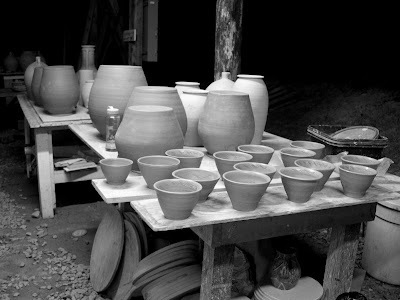 He did an awesome job getting all the pots glazed and loaded. How worried I was about the wood getting wet in our week of rain and how amazingly sunny and breezy it has been the last three days. 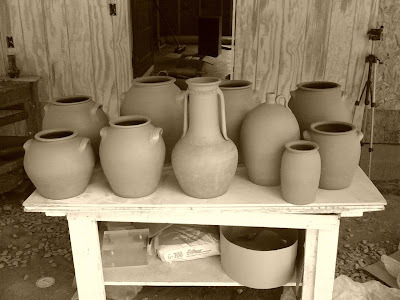 How exciting it is to think about all of the new pots that will be around in the next week. How I hope that a couple of hours sleep will be enough. As with most every day of this cycle of work, half of what is planned actually gets done, (maybe I should fire my planner?) 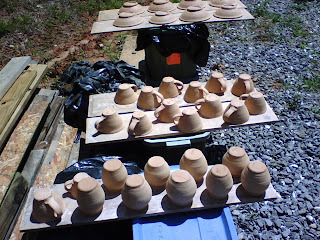 But I painted and slipped the last pots and will start loading in the a.m. 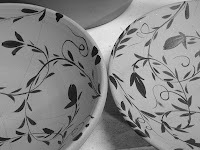 Here are some of the last pots that I decorated, and as usual, they were my faves. The brush was really going. 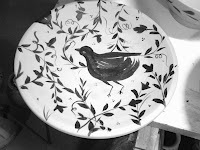 I had a thought tonight that maybe I should just paint, and have someone else make the pots??? Naaaaa... making the pots is just too much fun. 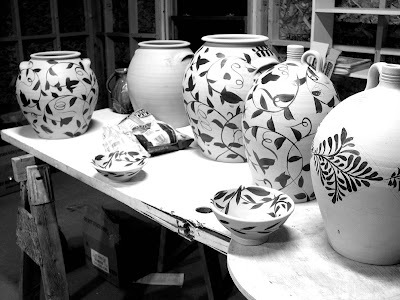 But it took all of these pots and several days, just to get warmed up with the brush. 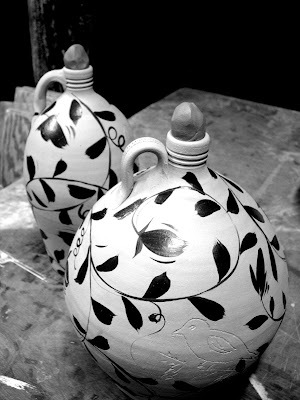 Before I dipped these jugs, I put in a clay stopper, because a couple of these I dipped right side up. 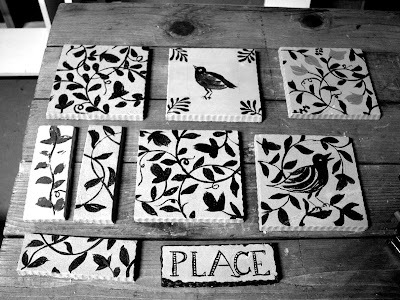 Tiles for a show at the Clay Art Center, in Port Chester, NY. The show is called 6 x 6. It's all tile from different artist, it should be a nice exhibition. I made these to be a little over 7 inches, so that they would shrink to 6 in. I'm just guessing, because I haven't tested this batch of clay. Hopefully they won't be that strict for the show. All in all it's been an interesting cycle of work. 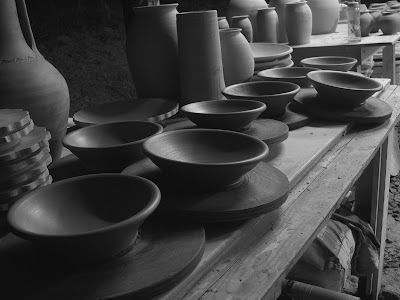 My helper, Mica and I really enjoyed dipping and glazing the pots in the bright sunshine. 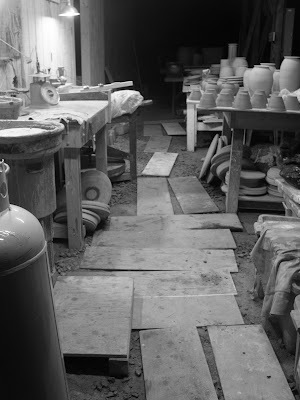 But for me the highlight of the day was walking the freshly glazed pots just the short distance from the new shop to the kiln, without having to drive them in the truck. Here are a few pictures for those of you out there who like to keep up with what's happening around here. 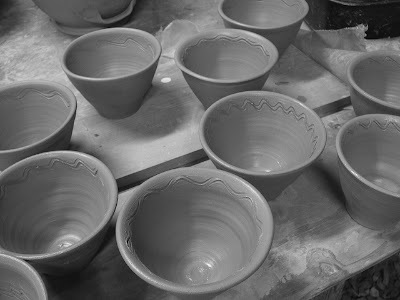 Today, Saturday, I'll be slipping all of these bisque pots with a white slip. It's what we affectionately call RJB. It stands for Randy Johnston Bisque. After I dab all of the slip that doesn't resist, I'll "line" all of the jars and cups with my alkaline ash glaze. Then's it will be stacking time. Mica Cain, a new resident at the Energy xChange, is on the payroll and is the only reason the kiln and I will be ready in time for the Labor Day Monday Firing! 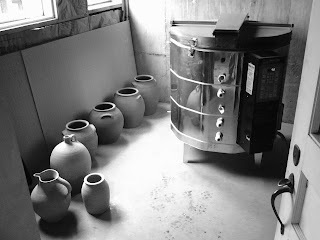 It will be my sixth anniversary and the 28th firing of the wood kiln ! 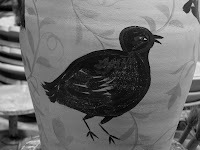 Here are some bird images I painted on some pots today. I'm trying to include some within the botanical imagery. It's always a little difficult to get the confidence to do something different, but after a couple of days of painting, I felt that I was ready. It sounds a little funny, but it does take time to get into it, so to speak. 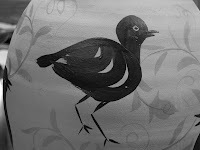 Since I am painting wax resist, once it's on there there's no going back and wiping off, well I guess I could but time is short and the surface of the pot would be all scratched, and that's not pretty. 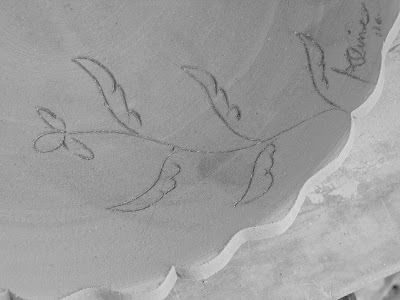 I can scratch details into the waxed areas, but I'm really fooling myself thinking that will work. We'll see next week. 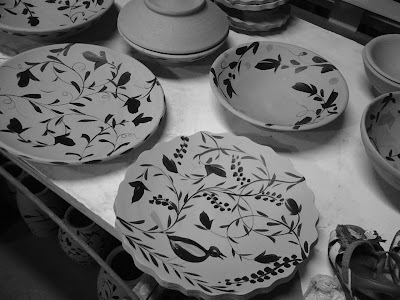 Kiln prep on Friday and more painting. Then it will be time for dipping the pots. Way back in the early nineties I came across a catalog of a show that was given to my friend Mark Shapiro. The catalog was in German and I had long forgotten any German I had learned as a three year old living in Germany. 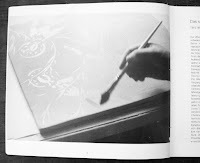 Yet the pictures were very inspiring and, little did I know, the images of Roman Scheidel painting in this little book had the single biggest influence on my approach to surface in my pottery ever since. By some miracle I found this catalog recently while packing my old studio. I thought I had lost it. So I took a few pictures to give you an idea of what I am talking about. I have wanted to post them at an appropriate time and since I am in the midst of some decoration work, now is the time. 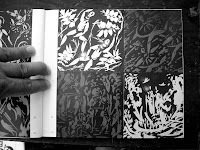 Also I found his web site and you can see better images here of Mr. Scheidel's work, and if you read German you're in luck. After seeing this catalog I commenced to learn all about painting with wax resist and using plant imagery. I wasn't quite ready to do figurative work as Scheidel had in the work, but I loved the beautiful brushwork of leaf imagery. Roman Scheidel is an Austrian artist who is mostly a painter, but is also interested in dance and ceramics. 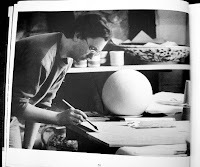 In this catalog it is clear that he is working with a potter, Felix Vogler, to make the ceramics. Here are a few pictures from today's work in the shop. It's late and I'm too cross eyed to write very much. Checked into the "kilns" this morning and all is well. Although, I'm a little worried about these pots being so light that they seemed to float! 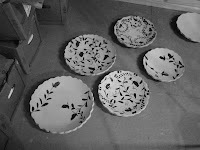 Good thing there is a lid on the kiln to keep 'em in. Actually they are stacked onto pots below that you can see. Ahh, you can't always believe what you read or what you see. We had rain today, nice and steady. 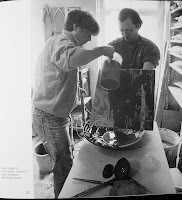 It put a little damper on my pottery transport, but it stopped after lunch and I scampered to Courtney Martin's and John Hartom's, respectfully. 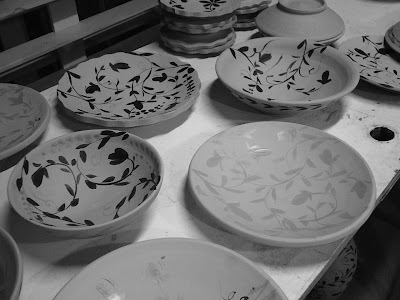 Here are some "exciting" pictures of the bisque scenes. 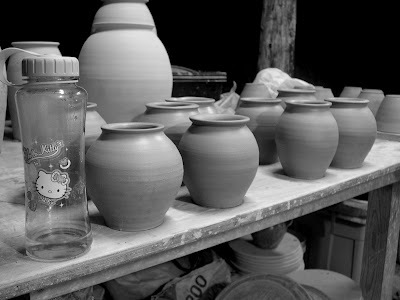 Both are Amaco computer kilns. Sweet! We just got a package from the coast. It was a paella pan from Keith Kreeger! Thank you Keith. We'll love it I'm sure. Stacey and I are excited about the package and the kids are excited about the bubble wrap! We'll give it a try and cook up a paella for the firing on Monday! D. Hayne is d. man. 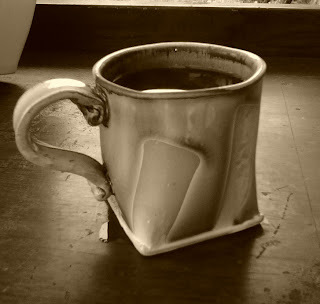 That's who made this wonderful mug, D. Hayne Bayless. Yes that's a square bottom and a round top! I thought the handle was reminiscent of the harvest jug handles I've been seeing on Ron's, Doug's, and Hannah's blogs of late. 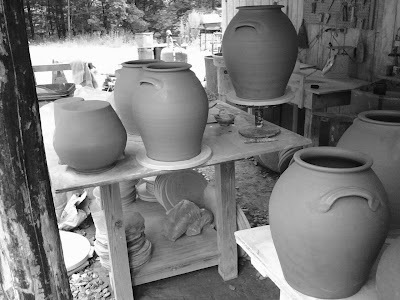 All of Hayne's pots are handbuilt, but he does use a wheel, a little known fact. 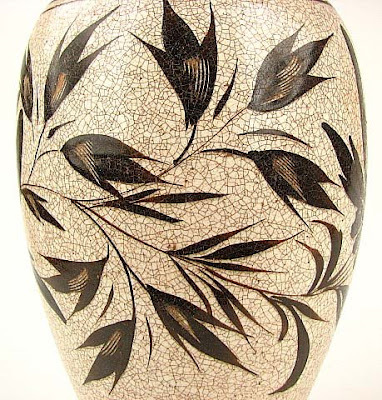 We have several great pots from Hayne, but we could never have enough, except our house is so small, we're limited. Ironically, Hayne's studio is named after a former tight and limited space he used to work in, "Sideways Studio". Now Hayne has built himself a beautiful full-sized studio at his home in Ivoryton, CT. and I always love staying there when I'm in town. 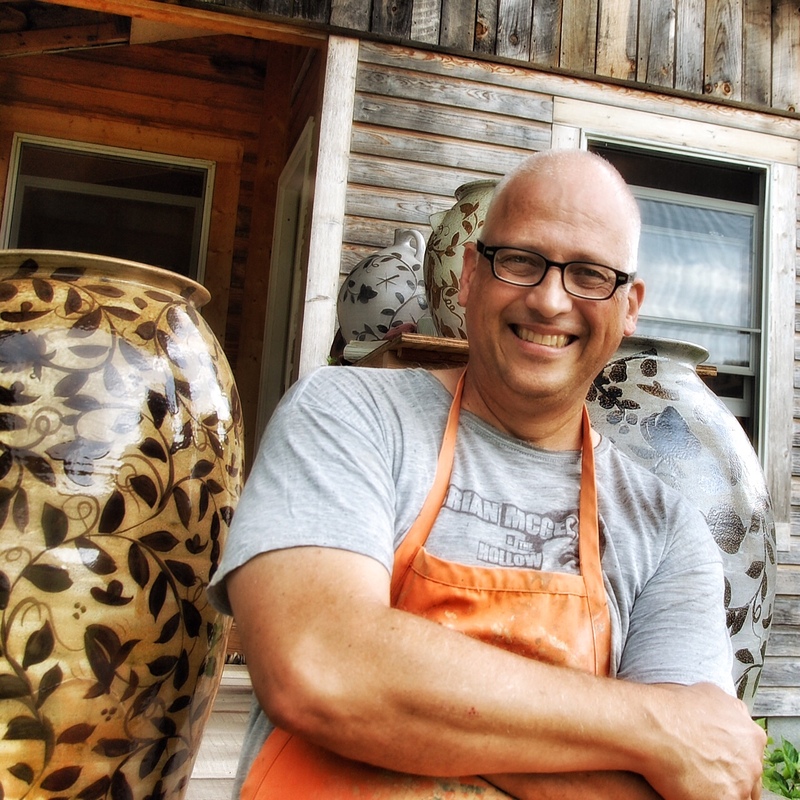 Like many potters, Hayne has a great big ole pottery collection. His guest room also houses his plethora of books about pottery, that keeps me up late every time. See his web site here. Had nice evening in the open air last night. Rain's a coming and the air was damp. We need rain, our pond is almost dried up. The hatch of midges seems to be over, and the cicada killer wasps weren't around tonight. The cicadas must have all been eaten, because i mostly heard the crickets gearing up for their fall concert. I threw a few cups and that was really a relief after throwing jars. It's a lot like the on-deck batter, swinging two bats before they step up to the plate. 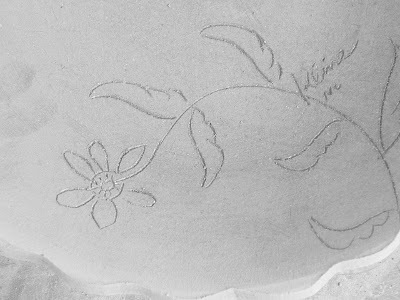 The small amount of clay, a little over a pound, was soft and rose up pretty effortlessly, but I had to be careful not to "strangle" it. 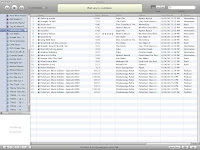 Here's what the table looked like. 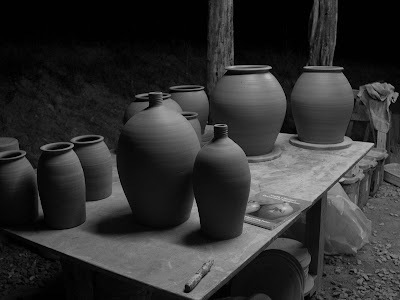 Can you tell the bisque from the raw clay in B/W? 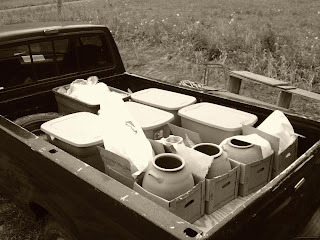 Today I will shuttle pots to various electric kilns in the neighborhood and get some pots ready for decorating. I need to mix some slip, maybe a little alkaline glaze, find my brushes, mix up a batch of wax, and wait for the rain. Have a good Monday! I just wanted to share some pictures of the handles I just put on some jars. I put a couple on yesterday, maybe a bit too late, ouch. So with the rest of the jars, still a little soft, I went ahead and attached them. What was I waiting for anyway? I guess it's a holdover from the old types of handles I make, that get pulled off the pots. These just get "laid" on and thumbed into place. So with my left hand inside the jars I used my right to do the thumbing. By thumbing, I mean that use my thumb to smooth the handle into place after it has been set into position. I use a little water on my thumb for lube. Here is an archived post on handles. Today's handles weren't done exactly as in the archive, but close. I didn't add the coil on the top of the handles. 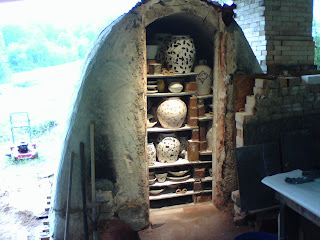 With about a week before the firing date most reasonable potters would be glazing pots and preparing the kiln. 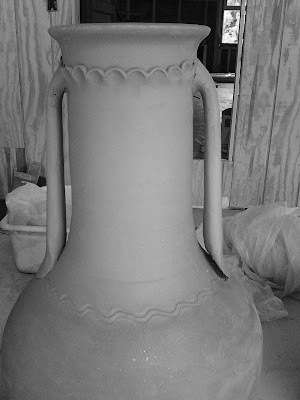 Since I'm not exactly reasonable or able, I will have to squeeze a few pots out of the wheel in the next couple of days to fill out the making list. 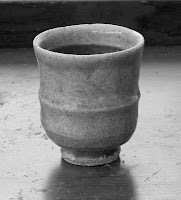 Usually I make small cups and bowls on the last wet day, or making day, and glaze them bone dry. 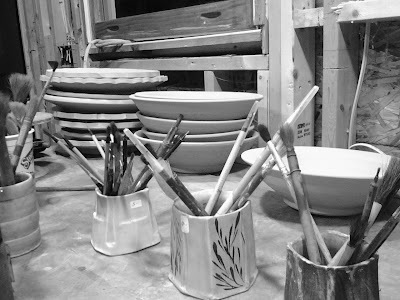 In other news, yesterday, John Hartom of Empty Bowls renown, let me fire his electric kiln at his place which is just a couple of miles down the road. 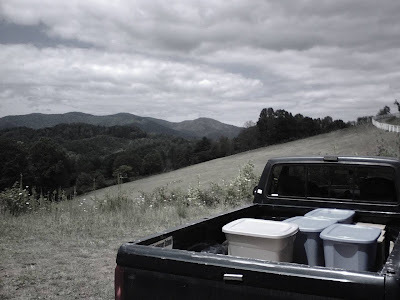 It's a great place with a beautiful long view over towards Green Mountain, NC. John and his partner, Lisa Blackburn, moved to the area about eight years ago from Michigan where John taught school. 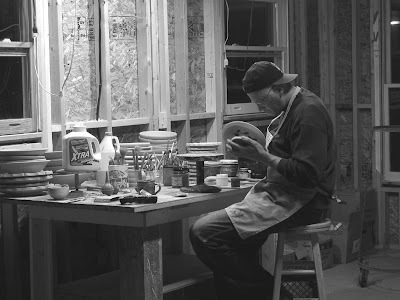 John retired and has set up his Empty Bowls headquarters in Yancey County just over the Toe River from here. 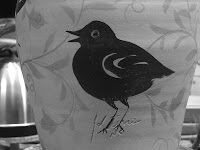 They've got a great collection of Burlon Craig pottery that I want to photograph someday, and I'll share it with you here. 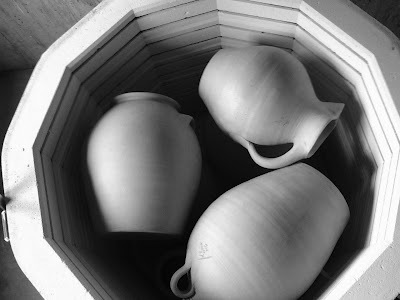 But for now, I have a couple of bisque kilns to load and a few more pots to make so I better get to it. Tom Turner alerted me to this piece on eBay. Here's the link. It was at $0.99 last time I checked. Not bad for Song Dynasty, No? Could this be what they're saying it is? See for yourself. 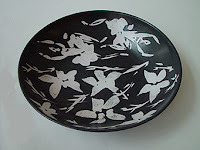 There are several other views on the auction page. 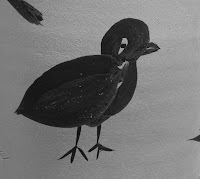 That brushwork looks pretty nice. I'm heading out to load some bicuits. Have a good Saturday. It was an OK evening up on the hill. It was very dry today and breezy so things dried instantly. Quite the opposite situation that I am used to at the Mushroom Factory, as you can probably imagine. 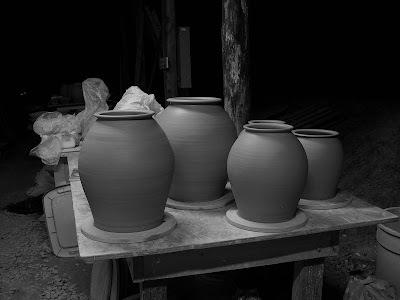 Here are some pictures of pots. Just a quick post before I head back up the hill for my after dinner pottery. 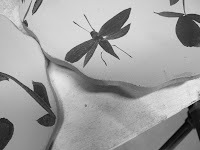 I wanted to send these pictures of some of the carving i have been doing on the platters. 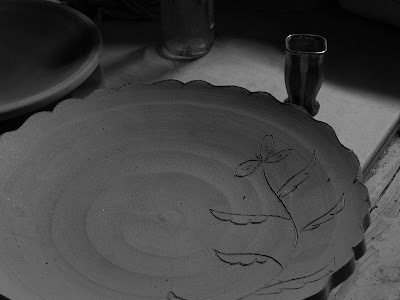 I also liked the edges of these platters, slightly different than previous. Can you see the difference in the rims? It's subtle. I particularly like the state of dryness they were in although it may not be apparent in these pictures. ***Also, thanks for everyone who signed up to comment with Disqus! So far there are 36 people signed up! 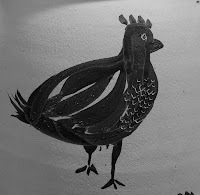 You may still comment on this blog without signing up, but you'd be missing out on the 'discussion' and missing your chance to win a piece of my pottery from the next kiln load of pots. 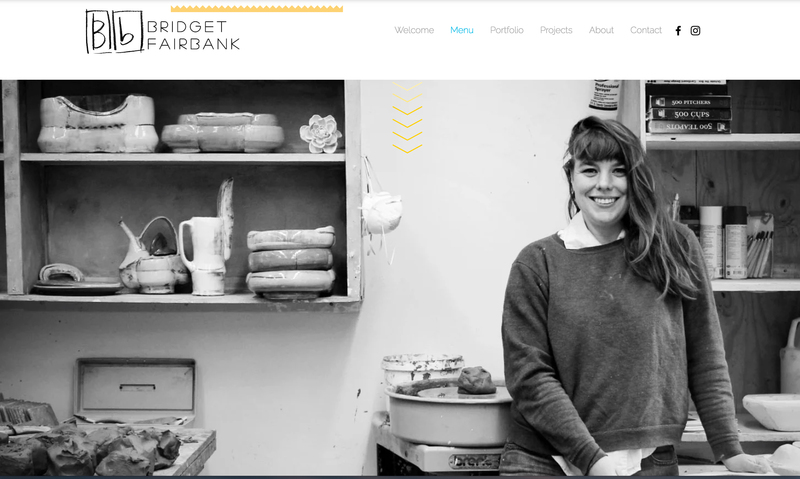 [See sidebar on top right] It's easy to use and I think it's been an interesting addition to the blog. Let me know what you all think.